ANAHEIM, Calif. /California Newswire/ — The Team AMVETS Welcome Home Program is pleased to announce it is one of 10 recipients for 2014 of Neotrope's annual J.L. Simmons Non-Profit PR Grant award. Team AMVETS' mission is to serve the veterans of our great nation, and to enhance the mental, physical and social well-being of all veterans. With this commitment, Neotrope(R) will provide public relations (PR) and cause-marketing support to the Team AMVETS Welcome Home Program over the next year to raise awareness around its programs and accomplishments. This grant will assist Team AMVETS Welcome Program in providing furnishings for every veteran in California who receives housing vouchers through the Veterans Affairs HUD VASH housing program in order to create a clean sustainable living environment which veterans and their families can call home. "We are grateful to have Neotrope help us raise awareness for Team AMVETS. Their services will be extremely helpful as we deliver furnishings like tables, chairs, and mattresses replete with bedding in order to make a house a home," says Sharon Elefant, Team AMVETS' Veteran Outreach & Community Development Manager. As part of this in-kind grant program, Neotrope(R) is providing PR solutions, news dissemination (through its Send2Press(R) Newswire service), and social media marketing for Team AMVETS Welcome Home Program. This cause-related marketing program is intended to help raise awareness of the non-profit to traditional media, to the public, as well as to potential sponsors and donors, regarding their efforts. "We're honored to be providing assistance to such a worthy cause as the Team AMVETS Welcome Home Program," said Neotrope CEO, Christopher Laird Simmons, a member of PRSA and ASCAP. "We selected Team AMVETS programs this year as they are doing wonderful work for a much needed outreach for our honorable military veterans." The Veteran Affairs (VA), in collaboration with the Department of Housing and Urban Development (HUD), provides vouchers to veterans who are working with VA case managers to rehabilitate themselves and find regular employment. While the HUD-VASH vouchers provide a safe, clean living space, the units are unfurnished, leaving these veterans to sleep on the floor with no means to cook, sit, or enjoy the basic comforts of a furnished home. It is this gap that Team AMVETS(TM) seeks to close. Imagine being homeless and then being given an opportunity to get off the streets only to realize that although you have a roof and walls, you still don't have the basic dignity of a bed or a sofa or even some dishes from which to eat. Thus, the "Team AMVETS Welcome Home Program" was established to fill this void. 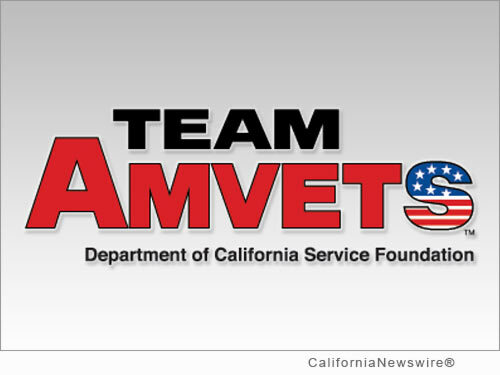 A partnership between the VA and the AMVETS Department of California Service Foundation, Team AMVETS provides furniture, appliances, and other household items to formally homeless veterans. The "Team AMVETS Welcome Home Program" has made nearly 1,400 successful deliveries throughout California, including San Diego County, Orange County, Long Beach, Greater Los Angeles, and Fresno County. The first delivery was made to a veteran in San Diego the week of Thanksgiving 2012 with a "Welcome Home" celebration. A residence is made a home by moving in brand new beds, sheets, pillows, blankets, dressers, night stands, couches, coffee tables, end tables, dining room tables and chairs, refrigerators, pots and pans, and special request items, such as towels or rugs in addition to a $25 grocery gift card and $100 gift card to a Team AMVETS Thrift Store. For more information on Team AMVETS Welcome Home Program and to help Team AMVETS Welcome Home Program support veterans, visit their website at http://www.teamamvets.com/welcomehome/ . To follow on Facebook, visit: https://www.facebook.com/TeamAmvetsThriftStores . Since 1983 Neotrope(R) has delivered services to raise organization awareness including brand identity, marketing, public relations (PR), and SEO services. Neotrope is also an entertainment publishing company involved in books, music, software, and online magazines. The company pioneered the concept of search optimization of press release content back in 1997 and has been at the forefront of many communication and technology movements for three decades. Neotrope was an Inc. 5000 company in 2009. More information: http://www.Neotrope.com/ . The Non-Profit PR Grants(TM) program was originally launched in 2000 to help assist U.S. 501(c)3 worthy causes to raise awareness, attract halo sponsors, and better connect with donors and volunteers. Starting in 2013, the Grant was named after the company co-founder, the late Dr. J.L. Simmons, PhD, who passed away in 2003. The Neotrope PR Grants are now known as the "J.L. Simmons Non-Profit PR Grant." With this cause-related marketing grant program, Neotrope has been honored to help many worthy causes in past years, including Camp Blue Skies, Catalysts Powering Educational Performance, Children Awaiting Parents, Food Finders, Inc., Fresh Start Surgical Gifts, Girls Write Now, Move for Hunger, The Native Voices Foundation, The Pacific Pinball Museum, The Bob Moog Foundation, Special Equestrians, Starlight Children's Foundation, The National Inclusion Project, World Savvy and dozens more. Grant recipients are selected by Neotrope/Send2Press staff based on qualified applications filled out and submitted by U.S. based non-profit orgs. Choices for grant "winners" are both subjective, and based on overall activities and actual need, as well as best fit for support from the marketing team. Additional information regarding the Neotrope 2013 J.L. Simmons Non-Profit PR Grant program for U.S. charitable non-profits and grant recipients can be found at: https://www.send2press.com/non-profit/ and also http://prgrants.com/ . Send2Press(R) (a service of Neotrope) offers best-in-class affordable Direct-to-Editors(TM) news distribution to working print and broadcast media, and to social media, with high visibility in search engines using proprietary Neotrope ContextEngine(TM) technology. Send2Press is unique because it was the first online newswire service with staff entirely comprised of accredited public relations professionals, published authors, working journalists, and marketing experts. The service was spun-off of Neotrope's traditional PR services in 1999. Learn more about Send2Press at https://www.Send2Press.com/about/ . Copyright © 2014 CaliforniaNewswire® and Neotrope®. California Newswire is a publication of the Neotrope News Network and a U.S. reg. TM of Neotrope.